The hardest part of capturing this shot was getting the coin to stand on its side at the right rotation. Otherwise, this is a an easy shot. 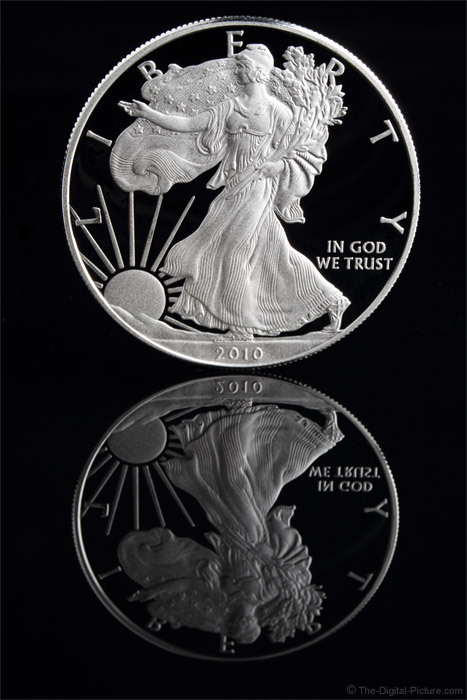 The coin is a near-perfect, highly-reflective 2010 American Eagle Silver Dollar in proof condition. The background is black velor draped over a box. The coin is sitting on very clean back-painted black glass (my desk). A tiny piece of card stock is under the coin to prevent it from rolling. A Canon Speedlite 600EX-RT in a small softbox was triggered by a Speedlite Transmitter ST-E3-RT. The softbox was directed downward onto the coin (I should have moved it back slightly to get an even reflection across the entire top of the coin). Insure that nothing reflects back onto the coin. Then use a macro-capable lens to capture your shot.